Izumi Shoji is a pioneer in vegan cooking in Japan, and has over 50 published cookbooks. 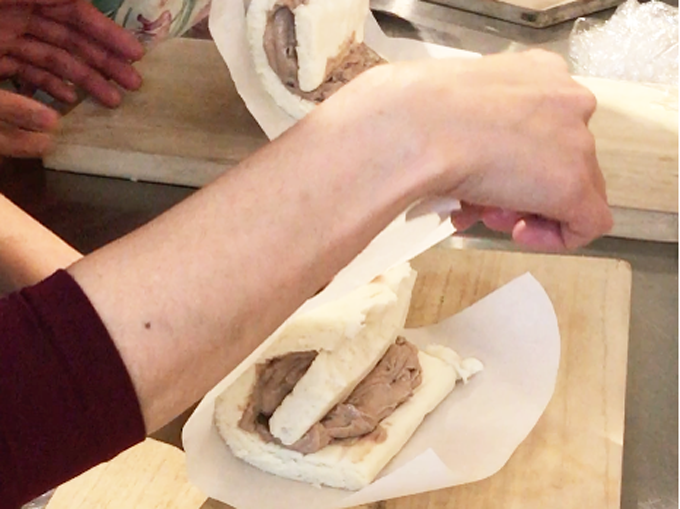 She started her Izumi Shoji Vegetable Cooking Studio in Yoyogiuehara, Tokyo, three years ago, where she holds plant-based cooking classes a few days a week. She teaches several classes herself, as well as having guest chefs and instructors teach. 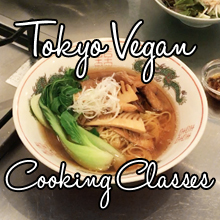 The classes cover various vegan cooking classes, ranging from Japanese, Asian and western cuisine. 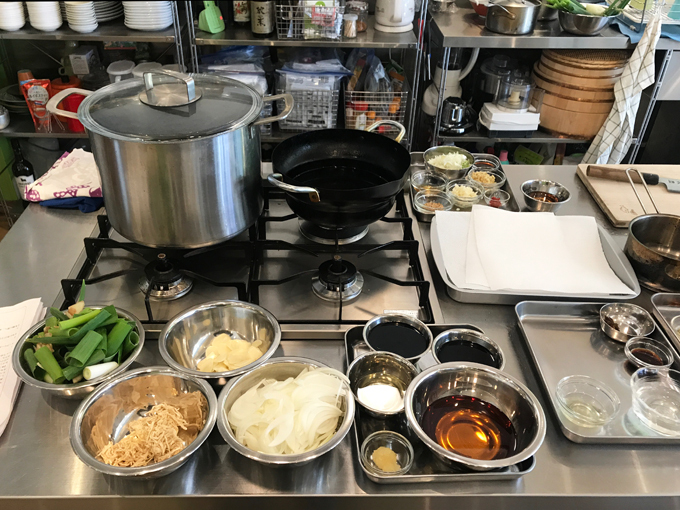 I took two classes here, a vegan ramen class and on another day I took a vegan and gluten-free roll cake class taught by vegan chef, Nobuyuki Kimura. 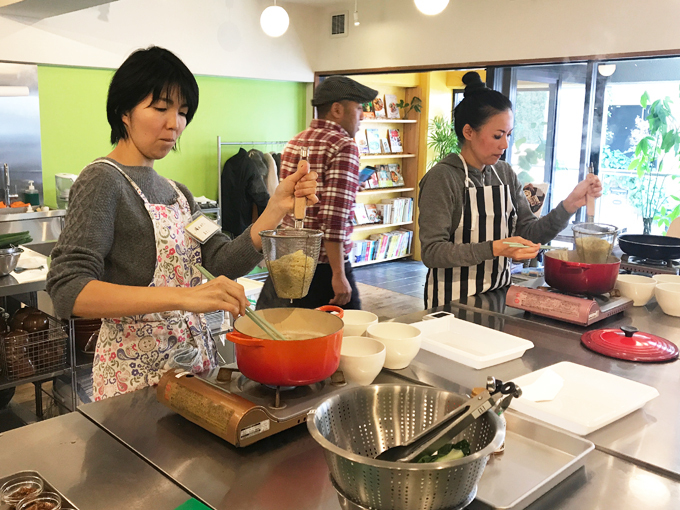 One of Izumi’s most popular classes is her vegan ramen class. She keeps this particular class to 8 people max because of how involved the recipe is, and because of this, it fills up fast. When I first saw it on her website, it was sold out so I had to sign up for the cancelation waiting list. Lucky for me, when I got on the list, someone had just canceled, so I was able to sign up! Perfect timing! 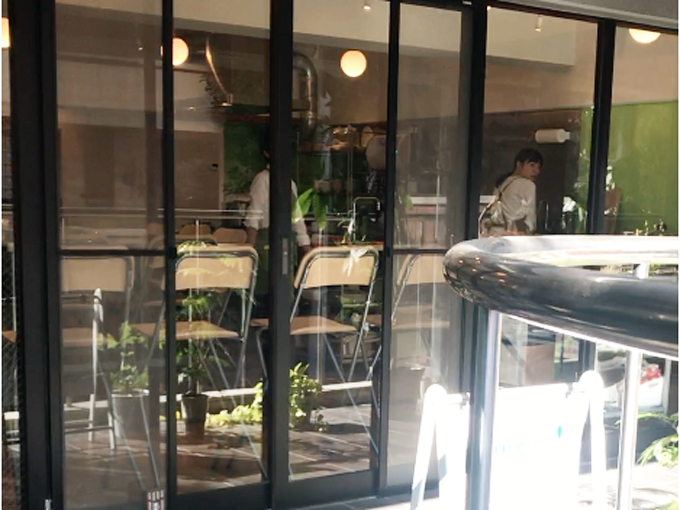 Her studio was easy to find, only 3 minute walk from Yoyogiuehara station, Odakyu line. Beautiful and a spacious kitchen space with plenty of natural light. The space was already filled with great aroma from the “mise en place” they had prepared for the demo. I could hardly wait to make vegan ramen! Izumi was super lovely and a wealth of knowledge. She started the class with a demo of the whole vegan ramen making process. First rule of ramen making, you don’t talk about ramen making! Second rule of ramen making YOU DON’T. . . I’m kidding. 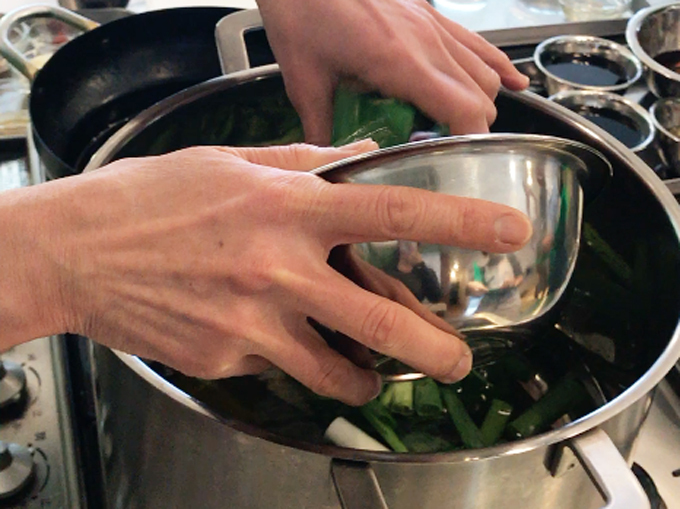 The first rule is, you have to make a good dashi (stock). 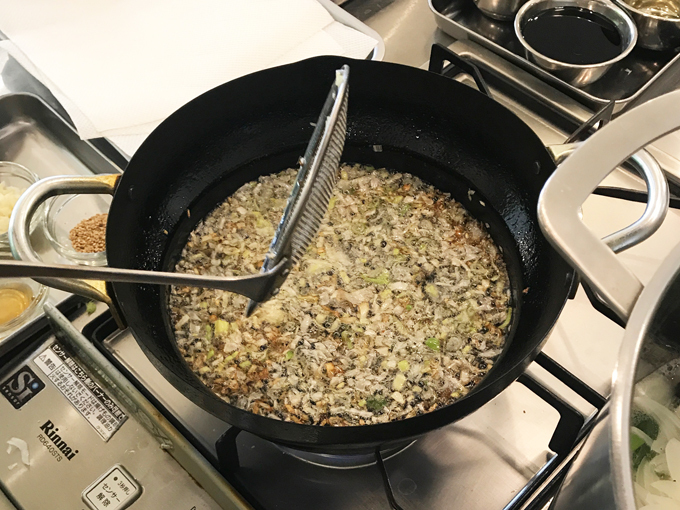 Dashi is essential in Japanese cooking, and you cannot make good ramen without making a good dashi first. This is what gives the ramen soup complexity and depth of flavor. You can’t just dilute soy sauce with water and make ramen soup, because that would just taste like. . . well, watered-down soy sauce! Izumi started by simmering dried kelp, dried shiitake, kiriboshi daikon (dried daikon), Japanese leaks, garlic, ginger, and onions in water to make the dashi. After simmering for about half an hour, she strains it with a chinois (sieve). Then grated garlic, toasted sesame oil, mirin, and soy sauce is added and re-heated to create the soy sauce based ramen soup. While the dashi was simmering for 30 minutes, we made some condiment and toppings to go with the ramen. Rayu, a spicy chili oil was made by frying Japanese leaks, garlic, and ginger in oil. This was transferred into a bowl and mixed with chili paste, soy sauce, mirin and crushed sesame seeds. 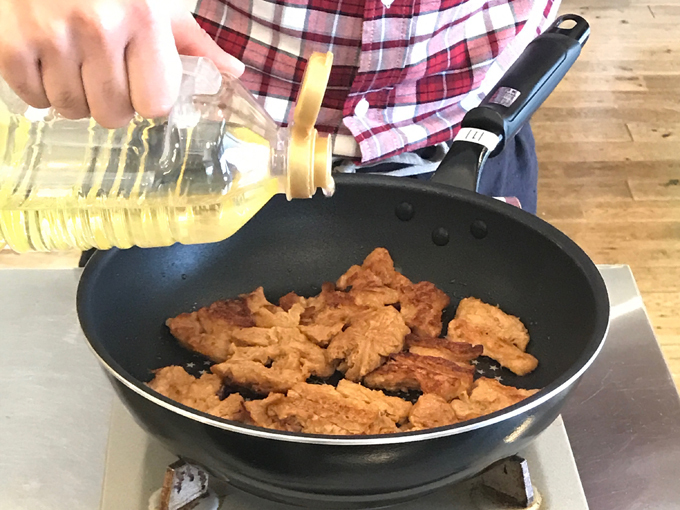 Toasted sesame oil and one dried red chili was heated up over the stove until it released its fragrant aroma, then the chili mixture was added to it and cooled off. Chashu, marinated and braised pork belly is a common topping for ramen. This was veganized by the use of soy meat. But here in Japan, it came in a dried form and had to be reconstituted in water overnight before use. The good thing about it was that it had no additives and the ingredients only listed “soy beans”. 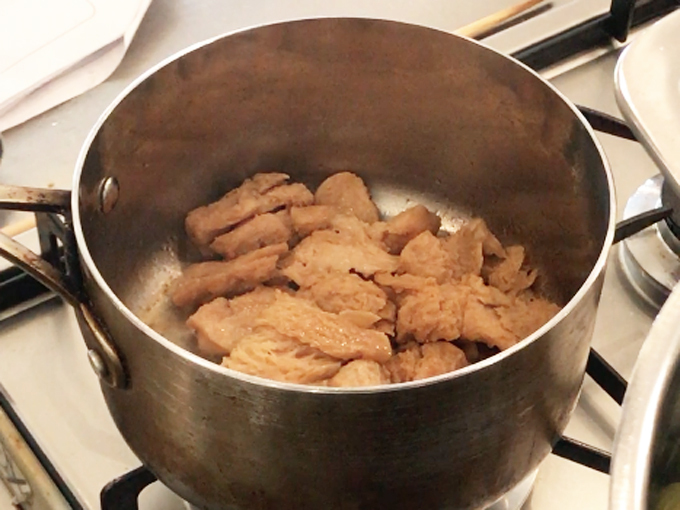 To make vegan chashu, the soy meat was deep fried, then simmered with soy sauce, star anise, saki, and kelp dashi (water of dried kelp soaked overnight). To finish it off, it was pan seared to give it a nice and crispy surface. She also made another common topping on ramen, menma. 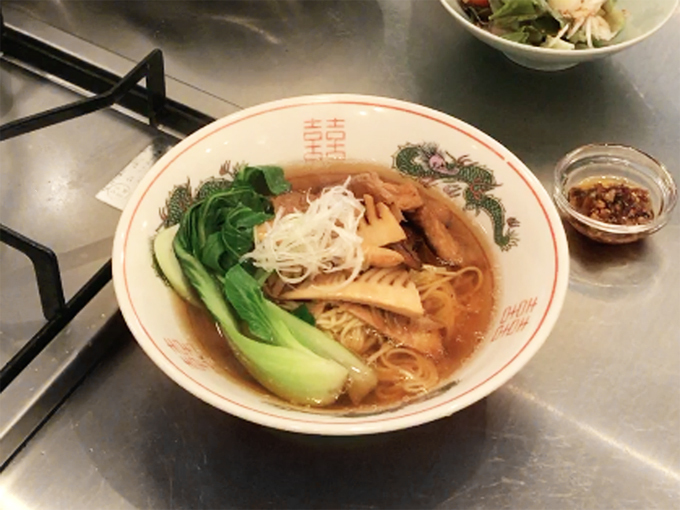 Menma is make by boiling bamboo shoots and cooking them in soy sauce, mirin, rayu (spicy chili oil), and saki. She also made a simple salted Japanese leak salad as a side salad. After all of the components were demoed, it was time for us to make the toppings and cook the noodles ourselves. We didn’t make the ramen soup ourselves because that would have been more time consuming, and Izumi demoed and made enough for all of us. This is student Kazz, pan searing the vegan chasu. He happened to be taking the class and is a Japanese vegan blogger, who writes about vegan eats all around Japan on his blog, Vegepples. He was the one who recommended I go to the Shin-Yokohama Ramen Museum to try out his pick of the #1 vegan ramen spot, Komurasaki. It was incredible, guys! You can read all about it here. After all of the toppings were ready, all we had to do was cook the noodles! My classmates hard at work! Tada! Vegan shoyu (soy sauced based) ramen, topped with bok choy, vegan chashu, menma, and sliced Japanese leeks, with a side of rayu. My goodness it was delicious! Great depth of flavor from the dashi we made. It tasted just like the good ol’ shoyu ramen I grew up with when I was a child. Brought back sweet memories! Izumi’s vegan ramen class was an absolute blast! I cannot wait to take more of her classes when I get back to Tokyo.